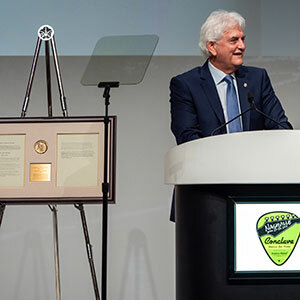 On April 25, Doug Hucker, CEO of the American Gem Trade Association, won the American Gem Society’s Robert M. Shipley Award, the group’s most prestigious honor. Hucker (pictured) won the award at the AGS’ annual Conclave, held this year at the Omni Hotel in Nashville, Tenn. The longtime industry executive and educator seemed genuinely taken aback and affected by the award. – John Carter, owner of Jack Lewis Jewelers in Bloomington, Ill., was elected to be the organization’s new president. He has served on its board of directors since 2011. – The organization’s 2019 Conclave will be held in Seattle, April 8– 10. – At its Titleholders Luncheon held on April 24, Sarah Nanasi Russell, director of marketing for NEI Group, won the Young Titleholder of the Year Award. The Guild of the Year Award went to the Seattle Guild. The Sallie Morton Award, which recognizes people who have gone above and beyond in their service to the AGS Guilds, was presented to educator and presenter Jennifer Shaheen, founder of the Technology Therapy Group. The group’s John J. Kennedy Award went to David Sexton, vice president of loss prevention for Jewelers Mutual Insurance Group. The group also paid tribute to the Herb Bridge, an AGS mainstay who died earlier this month, with remarks from his grandniece, Lisa Bridge, who serves as Ben Bridge’s president and chief operating officer.